If you have been hurt in a car or motorcycle accident, you’re probably in pain, under stress and have a lot of questions. You may be concerned about paying your medical bills, recovering your lost wages, dealing with an insurance adjuster that keeps calling, or a whole host of other issues. 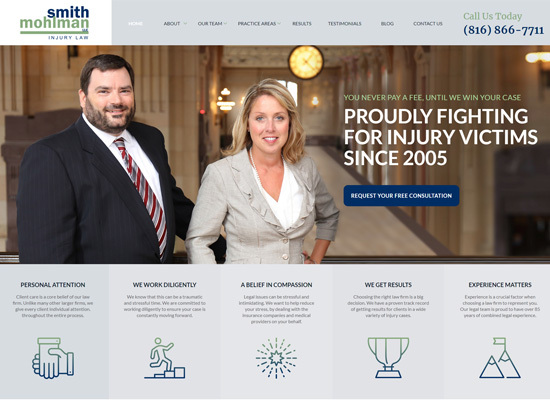 Our Kansas City personal injury attorneys can help. We will deal with your legal claim so you can focus on recovering. Car and motorcycle accidents happen in an instant, but the injuries can last a lifetime. Our Kansas City car and motorcycle personal injury attorneys have the experience to handle your case from start to finish. We know how Allstate, State Farm, American Family, Progressive, Farmers, GEICO, Travelers, AAA, Farm Bureau, and other insurance companies work to delay, deny and defend your injury claim. Our attorneys have over 60 years experience representing real people like you in personal injury claims. We know how important your case is to you and your family. We are not a high-volume, TV advertising firm. We only take a limited number of cases so that we can give each case the attention it deserves. We are not afraid to try your case, and we prepare all of our cases as if they will go to trial. That lets the insurance companies know that we take your case seriously and it leads to the best results. On the other hand, we also know that settlement is often in your best interest. We will work with you to find out what you and your family need, and we will work to achieve that goal. How Can We Help With Your Kansas City Car Accident Case? We will deal with the insurance company. Our priority is to make sure they get the information they need, but keep them from invading your privacy. If we get involved in your case, you will deal with us and we will deal with everyone else. We will answer your questions. If you haven’t had to deal with this type of situation before and you don’t know what comes next, we’re here for you. You will have direct access to the responsible attorneys on your case to get those questions answered. We will thoroughly investigate your case. We will contact the witnesses, the police, and the medical providers. We will figure out what other claims you may have and exactly what insurance coverage is available. We know what experts, records, documents and other information we need to prove your case. We also know how to collect information as efficiently as possible so we can move your case as quickly as we can. We will tell you the truth. We can’t promise you any sort of outcome on your case. We can, however, promise that you will know the good, the bad and the ugly about your case so we can work together to make the best decisions. Rear-end car accidents caused by drivers going too fast or not paying attention. Accidents caused by distracted drivers either texting or using a phone behind the wheel. Accidents caused by drivers under the influence of drugs or alcohol. “T-bone” accidents where the other driver runs a red light or stop sign. Accidents caused when a car gets run off the road by an inattentive driver. Head on collisions when a driver crosses over the center line and drives into oncoming traffic. Accidents caused when the other driver fails to yield. If you were injured in a car accident in Missouri or Kansas, you need help immediately in order to protect your rights. Contact our Kansas City car and motorcycle accident attorneys today. We can meet with you one-on-one to discuss your situation and work to get your life back to normal. Don’t hesitate to contact us immediately for a free, no-obligation consultation through this website or at 816-866-7711. Is your accident a motorcycle accident? Learn more about Smith Mohlman Injury Law’s representation on motorcycle accidents.